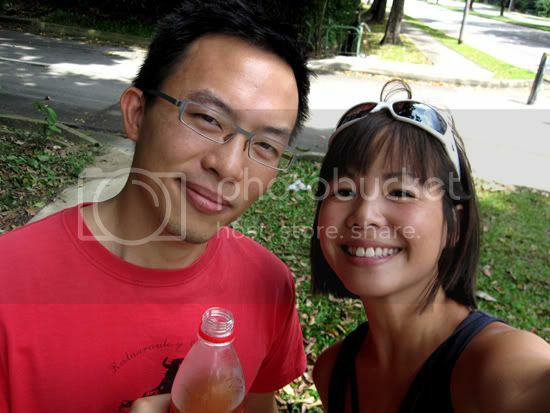 A couple of weeks ago, Hubba raced the Safra Avventura 2010 with my bike bud, Angela. Needless to say I felt so envious that Hubba was racing – I wanted to go too! But in truth, I was also glad he was finally getting out there in the sun and doing some running around. He’s been so cooped up of late ‘coz of everything he has got on his plate. Fellow supporter Chancho and I drove around using Google Latitude to try to locate our two wandering Sotongs, who were trying to stay in touch with us via iphone. The weather was scorching and there wasn’t much shade available, so we stopped at 7-Eleven and stocked up with goodies to help our Sotongs sustain! And to be honest, it felt good just being out there and watching my friends race and come in with smiles (albeit strained ones) on their faces. If there’s one thing I’ve realized throughout all that’s happened in the past few months, it’s that I’m not giving up on the dream. I want to jump off bridges again, to scale walls and waterfalls and flying fox into rivers and stuff again. I really miss it all. The adrenalin, the fun, the company of friends amid adversity, the satisfaction of crossing a finishing line and all that jazz. There’s a part of me that’ll remember those moments with much fondness, and who knows…. that part of me also hopes to make more of those moments! Action Asia, please come back to Singapore?!!! Want to do an easy ride next weekend perhaps? I would love to! But wondering how to fit that in with all the CNY visiting…. hope you don’t mind the posts was searching for photos from the safra race and came upon your blog. I can imagine how hard it is to not be racing. Hope your back is better. Its such a bummer to be out because of some injury. btw my race partner knows your hubby. He’s Andrew right? Anyways hope the back is better if not I can recommend a good physio. He saw me for my back and shoulder problems. Wait a minute, haha yes I spoke to Douglas after at the participant area. So you were his partner! Yeah small world eh. We were housemates back in Melbourne.